While working on a recent branding project for a wedding photographer, I put together a list of really pretty font combinations for her to choose from for her business card design. I’m still working on her branding package and polishing up that project (will post it when I do! ), but I wanted to share the collection with you because these gorgeous suckers are all free! This entry was posted in Design Resources, Typography by michelleblackshire. Bookmark the permalink. They look great, but they are not all free. Some of those typefaces listed are not free for commercial use. You might want to double check! What font did you use to name each of the fonts? What font did you use to write the name of the actual font? It looks beautiful. I am looking for that Roadtrip Songs free font. Any idea where I can find it? where can u find these fonts? What font are in the font names in? Thanks! Reblogged this on Design and Things blog. This is what I’m looking for. ❤ Lovely fonts! Thanks! hi! 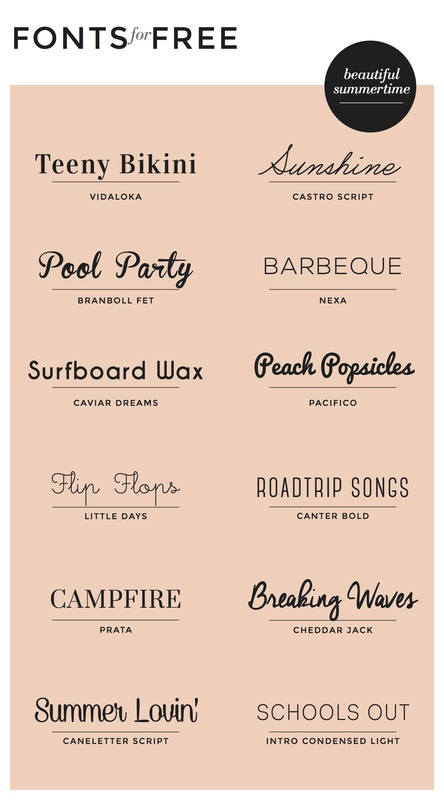 what font are you using under the font (under peach popsicles it says pacifico)? What are the real names of the fonts?? How Can I download these free fonts? Hi! Which is the font you used to name all the other fonts? Love it! Beautiful font! I like it.